While you never want to call us, you’ll be glad you did. 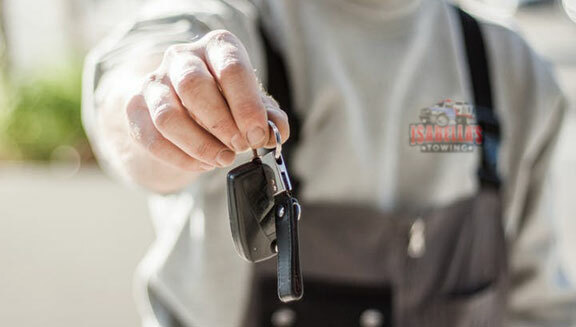 Isabella’s Towing sets itself apart from any other towing company in Henderson, NV with a commitment to the best in customer service with fair and upfront pricing and fast response time. We understand that every person who calls us is dealing with emotional strain and a great deal of stress. You can count on us to understand what you’re going through and get there quickly to help.Isabella’s Towing offers light- and medium-duty towing in Henderson. We only perform voluntary tows, not repossessions or impounding. We are committed to providing reliable yet cheap towing in Henderson to help you out of a bind without leaving you with a new financial burden. Whether you’re dealing with the aftermath of a car accident or mechanical breakdown, our fast towing in Henderson means your car can be delivered to a mechanic in no time. Along with towing service, we also offer a variety of roadside assistance services. If you’re stranded with a flat tire, dead battery, or you ran out of gas, you don’t need to call a tow truck for a tow. We can come to you and get you back on the road — sometimes within a few minutes of arriving! Many of our customers have never had to tow their car before. It can be a stressful and nerve-wracking experience. At Isabella’s Towing, we do everything we can to ease your worry and make our towing service fast and easy. When you call our car towing company in Henderson, please let us know your exact location, what happened, and anything we should know, such as whether you’re stuck in a tight parking garage or a ditch. Until we arrive, here are some tips to keep you safe and make the towing process as fast and easy as possible. Always stay aware of your surroundings. Don’t accept rides from people you don’t know and let anyone who asks know that the tow truck is coming. Stay in your car with your seatbelt on! Don’t get out unless you are absolutely sure it’s safe. If you get out of the car, don’t stand next to it in case someone hits your vehicle. Turn on your car’s hazard lights and put down cones or flares if you have them. Gather insurance documents, your registration, and personal belongings to be ready when we arrive. Anyone can find themselves needing to call a tow truck. You may have been involved in an accident or your car may be broken down due to unexpected mechanical issues. Needing a tow truck in Henderson, NV isn’t just inconvenient; it can be one of the most stressful events you will face when you’re late to pick up children or get to work. At Isabella’s Towing in Henderson, we understand what you’re going through. With our cheap towing and fast response time, we do our best to take the stress and hassle out of getting a tow. Give us a call and let us know the circumstances of what happened and where you are located. We will give you an estimate for our car towing service and let you know when we will arrive. We will immediately send a tow truck to your location to keep your wait as minimal as possible. If you’re stranded in the Henderson area and can’t move your car, give us a call for fast rescue! We don’t just offer cheap towing in the Henderson area; we can also respond quickly for roadside assistance. Our roadside assistance services can get you back on the road quickly, usually in a matter of minutes once we arrive! Save yourself the cost and hassle of paying for towing in Henderson. Give us A Call and let us know what’s going on so we can send someone to you & Right Away. Dead battery? It happens to everyone! Your battery may be dead from leaving a light on or door open all night. Older batteries can also fail in the extreme summertime heat. 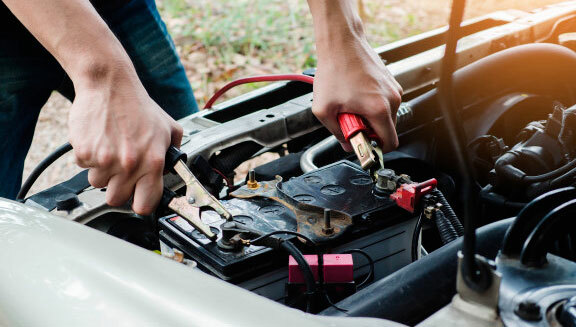 Don’t panic, we can be there quickly to give your battery a jump start that will have you on your way in no time at all! Run out of gas? Low on motor oil? Isabella’s Towing can help. Don’t be embarrassed, this happens to everyone! You can count on us to send a tow truck driver to your location right away with a few gallons of fuel or motor oil to put you safely back on the road. 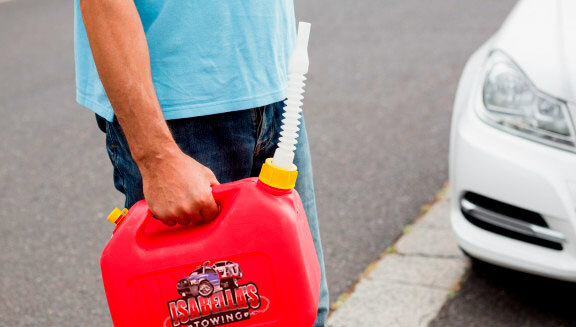 Our emergency fuel delivery is an affordable way to get moving again when you’re too far from a gas station to walk. We will deliver 1-3 gallons of gasoline that will be enough to drive to a gas station for a fill up. Is there anything more frustrating than a tire blowing out or going flat? It’s more common than you think, especially in the Henderson summertime when high road temperatures increase the risk of a blowout. Isabella’s Towing in Henderson will put your spare tire on for you so you can drive to a tire shop for a replacement. If you don’t have a spare, we can usually inflate your flat tire enough for you to drive to the shop. Have you locked your keys in your car? Don’t worry, we’ve all been there. Everyone has off days or has experienced the rush to get to work or get the kids to school, only to realize the keys have been left in the ignition or trunk. Isabella’s Towing can save the day. Our friendly tow truck drivers have the training and experience necessary to quickly and safely open your car door without damaging your car. Don’t break your window or try to pry the door open yourself; you’ll just end up with a big repair bill! Our car lockout service is affordable and fast. We can open all manufacturers and models!